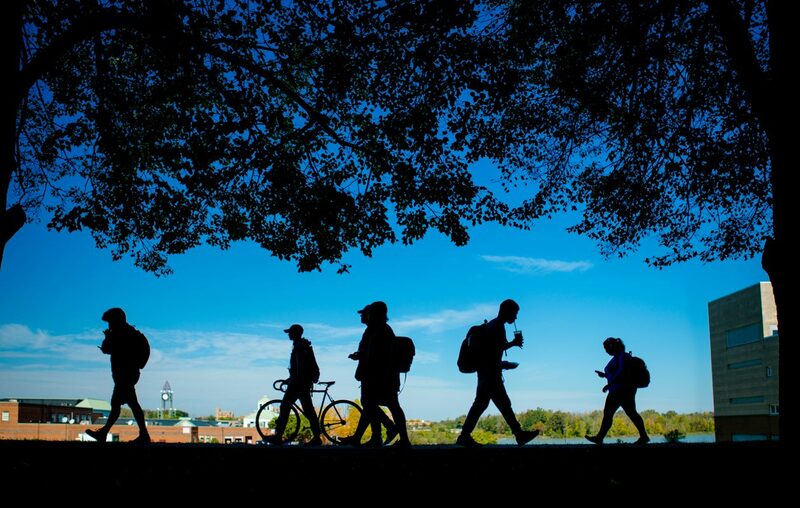 Students walk along University at Buffalo’s North campus. We might be a little biased, but there’s no better place to experience college than Buffalo. There are countless reasons why you should stay in the city for school, from food and nightlife to affordable living and the community of people. Let’s dive into the nitty-gritty of why you should think about staying in the Queen City for the next chapter of your life! When attending school at Buff State, I noticed a ton of people from central New York came out to Buffalo to go to school here and wondered why. It became apparent that other nearby cities don't have the same options that we do, with a variety of schools specializing in different fields. Buffalo State has a wonderful art program as well as early childhood education. NCCC as an incredible culinary program, were you can learn to master dishes and maybe even your own restaurant someday! The possibilities are endless right in your own backyard, so why leave your family…where you can do your laundry for free? Or visit them often, I meant. If you head to a big city for school, you'll realize pretty quickly when you're only eating Ramen and have an apartment the size of a shoebox that it’s not all it's cracked up to be. Sure, there are benefits to being in larger hubs, but Buffalo is on the rise. We have big-city vibes without all the expenses. Our rent is affordable with some very unique places available. After meeting some friends your first year, you can explore these options—like apartments in renovated mansions in the Elmwood Village, Allen, Hertel Avenue, and the heart of downtown, walking distance from bars, restaurants, markets and entertainment. Travel and Leisure named Buffalo “America's friendliest city,” and if you've lived here for the majority of your life chances are you understand why. You could be anywhere...in line for coffee or buying groceries at the co-op, and everyone just talks to everybody. We're a friendly bunch—and welcome newcomers like we’ve known them for years. Locals are always proud of being able to call Buffalo home, eager to show out-of-town visitors what’s so special about our town, besides it smelling like Cheerios. It’s fun to be a part of that positive community of good neighbors! Now, this is a huge one. It's no secret that Buffalonians are extremely proud of the food scene. Let's be honest, we've thought of some great ones! We have sponge candy, beef on weck, chicken finger subs, spaghetti parm loaded with an entire log of mozzarella, and some of the best pizza in the entire country. Really though, the Daily Meal compiled a list of 101 Best Pizzas in America for 2018 and three of our pizzerias made the list. Bocce Club Pizza perfected the cup and Char “grease pool” pepperoni, Jay's Artisan Pizza will literally run out of dough on the regular they make so many pies for locals, and La Nova is a popular choice with some of the best BBQ pit wings in the city to pair with the pizza. Speaking of wings, that's a huge pull on its own. We're not only the home of the National Wing Fest, where people travel from all over the world to eat some of the best wings and watch people go bobbing for drums and flats in a baby pool full of blue cheese, but we have so many hole-in-the-wall places that are serving the best wings in the country. Other cities just don’t make them like we do here—and they use ranch for dipping. It’s ridiculous! There's just no beating the nightlife here. When friends used to visit from out of town, they’d want to take on the 4 a.m. challenge, and a lot of them just couldn't handle it. Don’t worry, visitors, it takes years of dedication and practice. In addition to becoming an official “last call, 4 a.m.” pro (seriously though, there are shirts), bars don’t regularly demand expensive covers or serve overpriced drinks. Chippewa is a vibrant, young scene with Instagrammable places blasting music, the Elmwood Village and Allentown have some calmer bars with games and live bands, and the city in general has breweries and bars scattered throughout. Whatever your style is, there’s a fun place for any group! I know this might not be the first thing you think of when you're picking the school, but honestly it adds a lot to the setting. City Hall completes our beautiful skyline, but we also have buildings recognized worldwide like the historic Hotel Henry, Central Terminal and Frank Lloyd Wright's Martin House Complex. Plus, there’s a new popular site taking the city, and social media, by storm: The hot pink glitter stairs at Misuta Chows, Buffalo's newest bar-meets-arcade! Sure, we have the Walden Galleria Mall and the Niagara Falls Outlets, but I'm talking boutique shops. The Elmwood Village, Hertel Avenue, East Aurora and many other neighborhoods around town are filled with little shops full of clothes, shoes, jewelry, sunglasses, trinkets, games, spices and really anything else you could be looking for. Most are affordable, making it easy for local college students to support small businesses. After spending enough time in certain areas of the city, you’ll start to see the same people making an appearance. That includes my personal favorite in Allentown, the Bubble Man, who always has bubbles coming out of his window near Cantina Loco. Really, all the time. I think he has some kind of machine up there that helps him when he needs some time off, but often you’ll actually see him there filling the corner with bubbles! Now, I know it's a little difficult when you're staying in the dorms, but again, if you move into an apartment after meeting some people at school or commuting for the first year, you might want to consider adding a fur baby to the roommate situation. If you do decide to get a house pet, you picked the right city to do it in! BuzzFeed labeled Buffalo as the “Best Dog Friendly City,” a title we’re definitely proud of. Here you get two legal drinking age birthdays because it’s common to celebrate turning 19 by going to Canada. There's affordable hotels on Clifton Hill and so many fun bars to explore like Boston Pizza and Niagara Brewing Company. There’s plenty of other fun things to do, too, like miniature golf, haunted houses, arcades, rides and more. I mean, where else can you zipline out of a silo into the patio of a brewery? There are so many exciting, adventurous things to do here like ropes courses, ziplining, mountain coasters, hiking in Letchworth, Zoar Valley, and Devil's Hole, jet boats, water bikes (and ice bikes) and so much more. There's so much to do in the summer and winter on a regular basis that it's hard to get bored in Buffalo. This might be kind of a bold statement, but I have to admit I feel like I know an abnormal amount of people that have either stayed in the city, migrated back to the city, or want to come back as soon as the right opportunity presents itself. There's just something about Buffalo that draws people back in!